Can Odonil Liberate you ? One particular work that I liked is “Evaporating Self”. It’s a sculpture of his own image made out of the material used for air fresheners. 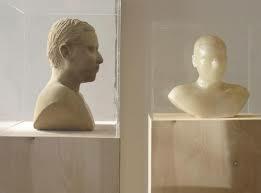 Given the material its made from, the seemingly solid bust, over a period of time disintegrates & disappears. You can actually see the work evaporating into air in front of your eyes in a few months. A transition from form to a formless state. The primary goal of Vedanta is to remove the false identification you have with your body and make you identify yourself as Atman the pure Consciousness. Through a process of systematic unfolding of the scriptural knowledge, you shed the notion that you are a body with Consciousness to that of being Consciousness with a temporary body. So the next time you sit on the potty, look out for the Odonil and construct an image of your bust made from the same material. Imagine it evaporating slowly leaving just an empty Space or pure Consciousness. Identify yourself with that space and Consciousness and you too can have your eureka moment. Only don’t be so disengaged with yourself that when you walk out you forget to wear your clothes like Archimedes did ! Remember you are Consciousness but with a temporary body.